Some of you might have heard of Heston Blumenthal and his marvellous feasts he would prepare on his TV show. 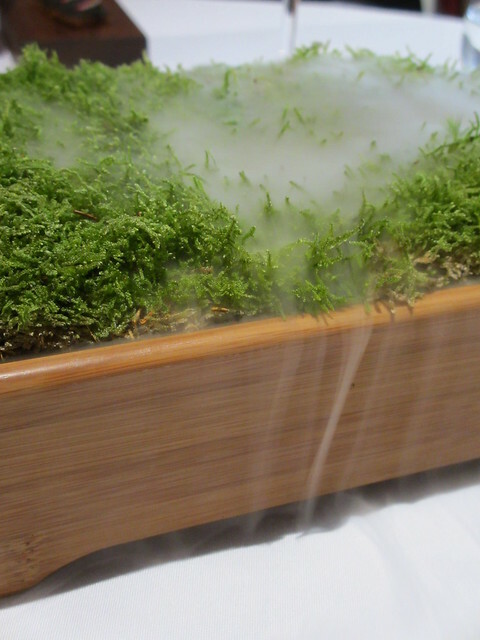 Rob and I used to love watching that TV show in NZ and Australia – He loves using dry ice to freeze ingredients. He make things that don’t look edible (like grass and soil garden) be delicious and the experience always seems to be wondrous. 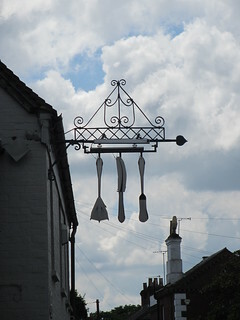 Well, he has a restaurant in his home town, Bray, just outside London – The Fat Duck. We saved up a bit of dosh and decided to go enjoy the full set menu. Just like there’s a difference between seeing Edinburgh Castle in a picture and walking around its stone walls, so too we were expecting to be amazed by a Heston Feast. We weren’t disappointed. There are 14 courses in the set menu, and we got a special 15th to start. Fifteen courses! We were expecting a range of flavours and a bunch of surprises, and we couldn’t wait to get started! Course 1 – Beetroot and horseradish cream. Such a little dish and full of flavour – but very light and crispy like air. A brilliant first start. 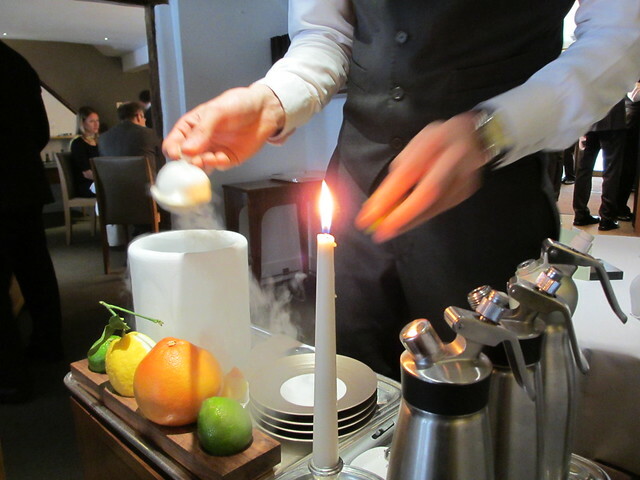 Onto course 2 – Nitro Poached Apertifs. What a name and what a setup! We were intrigued! This course was prepared in front of us, which was great. Dunk a teaspoon of a white spirit like vodka, gin or tequila into some dry ice. 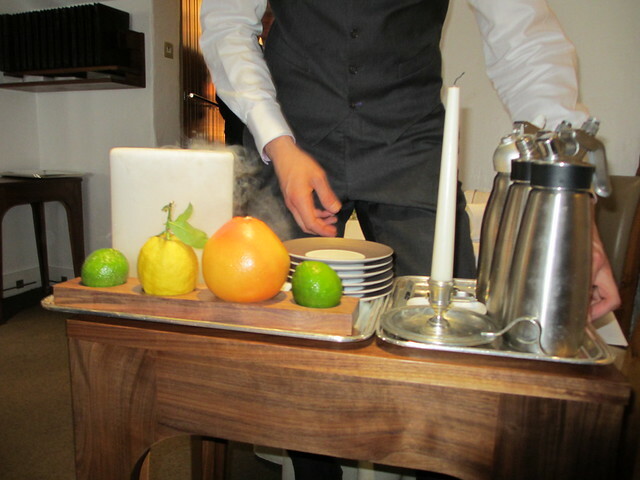 Then squirt a bit of citrus zest onto the frozen ball. We each picked a flavour combination (vodka and lime, gin and lemon, and tequila and grapefruit) – they were refreshing and cool but not cold. Lovely! Nice to have the servers actually do some of the meal prep in front of you! Brings a bit of performance to the meal. We were pretty pleased! 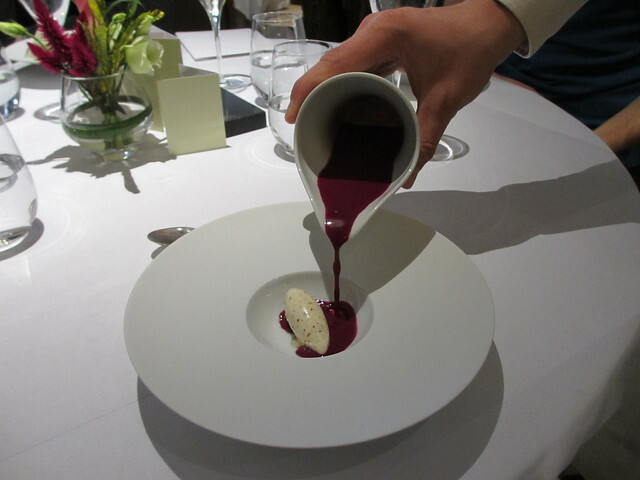 Course 3 – Red Cabbage Gazpacho and Pommery Grain Mustard Ice Cream. 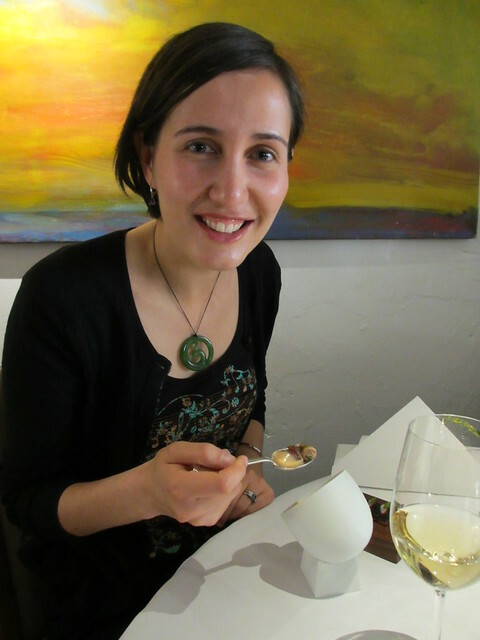 So the ice cream wouldn’t melt before it was served, the gazpacho was poured at the table. 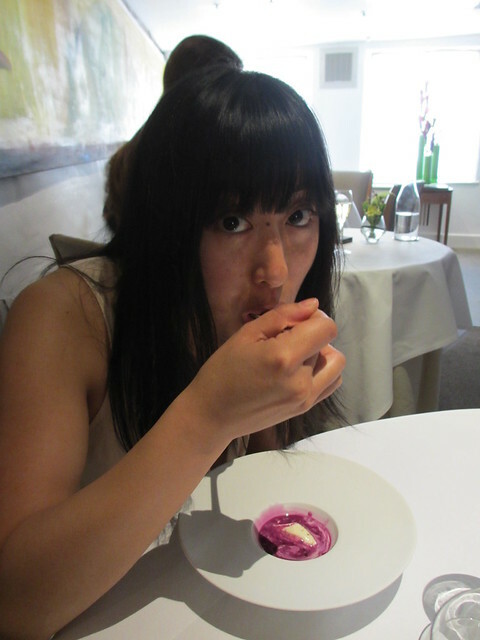 The ice cream had a great mustard flavour that complemented the simple red cabbage flavour deliciously. While not amazing, it was a nice. Course 4 – Jelly of Quail, Crayfish Cream, Chicken Liver Parfait, Oak Moss and Truffle Toast. 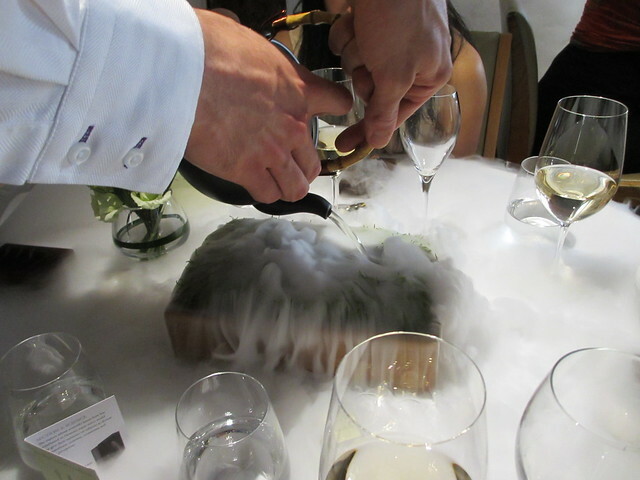 Firstly, we were presented with some oak moss covered in dry ice for dramatic effect (smelling, not eating!). Then we were given some oak flavours jelly wafers that melted in your mouth before you got into the edible part of this course. Really, the name kind of says it – this was a complex dish with lots of parts and flavours. It was certainly an adventure, but I don’t know if I understood the path! 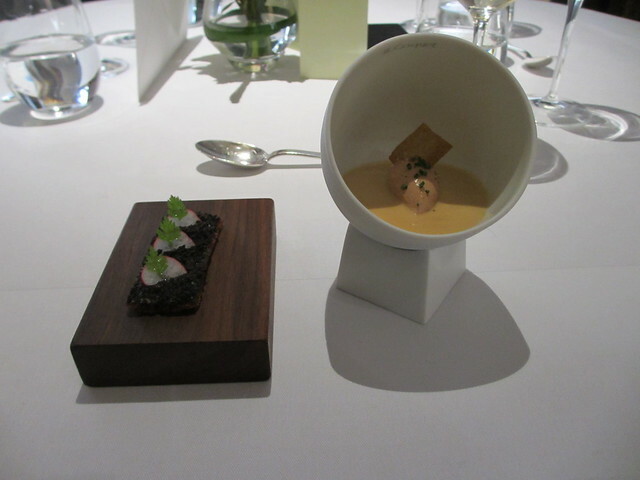 The crayfish cream was smooth and tasty (in the oval dish to the right) with the chicken liver parfait on top but had this weird cold layer of jelly quail underneath, which flavour wise I would not be able to describe. I wouldn’t try to recreate it at home, but it was a taste experience none-the-less. 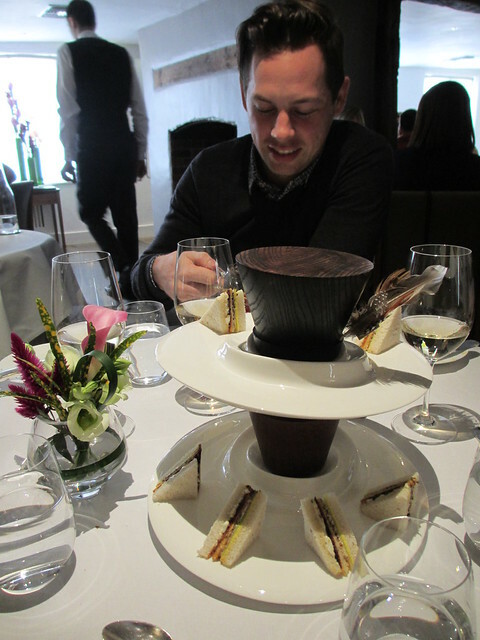 Rob thought the truffle toast was awesome – and I do agree. 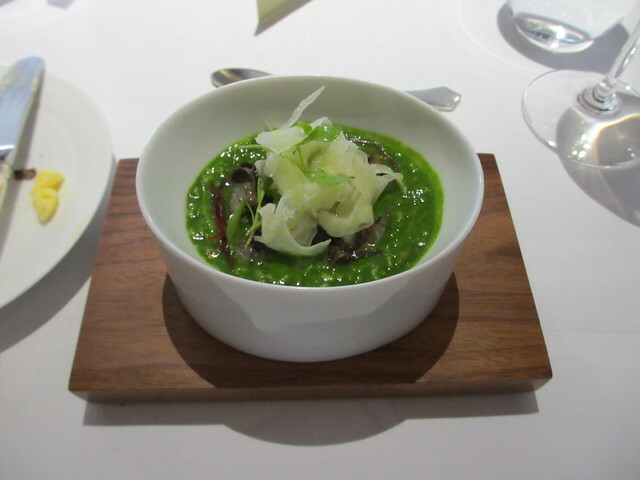 Course 5 – Snail Porridge with Iberico Bellota Ham and Shaved Fennel. I know, I know. The name seems off-putting (the snail bit) but it was very yum! 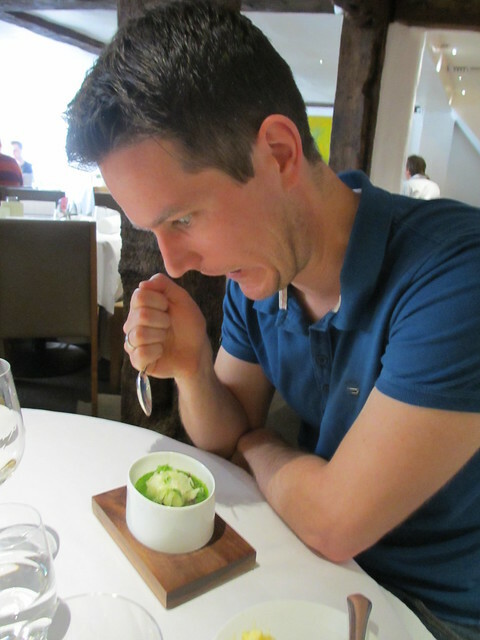 It’s one of Heston’s signature dishes and I can see why. It was a warm dish, with delicate flavours of garlic butter and the salty ham. Really nice! Course 6 – Roast Foie Gras with Barberry, Braised Kombu and Crab Biscuit. 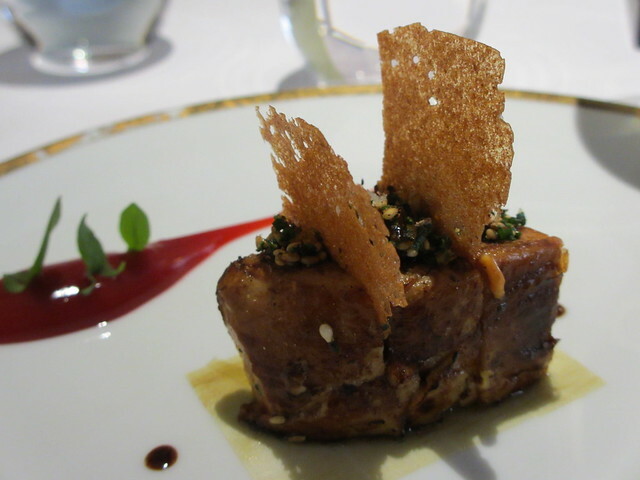 I’d never had foie gras but was assured by my friends that this was some of the best they’d ever had. 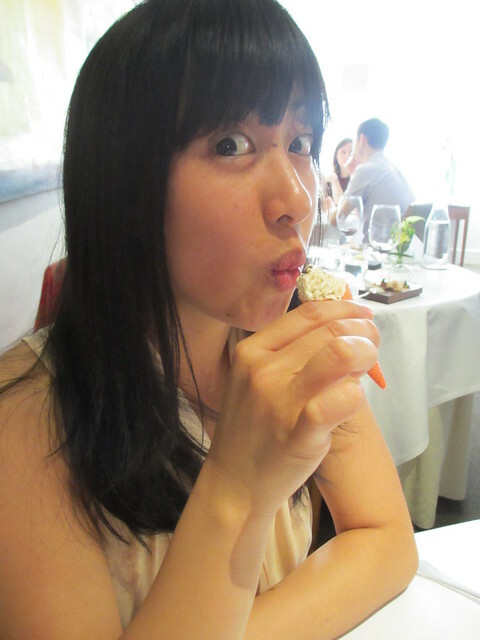 Foie Gras is made from goose or duck liver, but it was the smoothest silkiest pate I’d ever had. Barberry’s are like blackberries and made the sweet red sauce you can see. Overall, it was an amazing dish with a beautiful balance of flavours. A real treat! 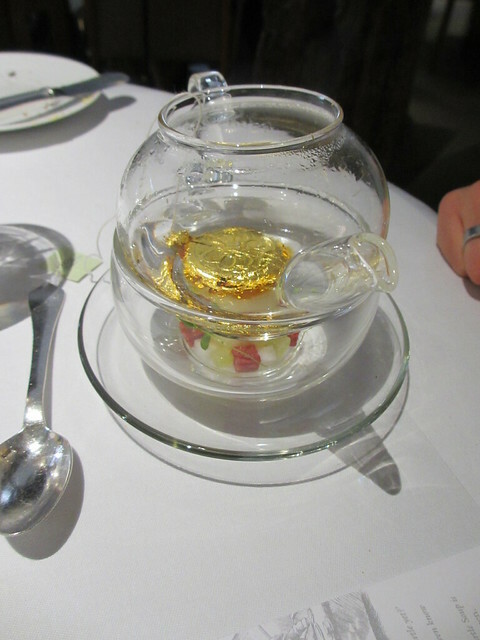 So, they gave us a glass teapot full of hot water and dropped a gold pocket watch in. What!?! The watch was essentially a stock cube covered in gold leaf. The watch dissolved and we poured the liquid into the Mock Turtle soup cup. Heston had researched this course himself (we remember it from TV). The other side of the mini menu card talked about ‘The Mock Turtle’s Story’. Turtle soup reached the height of its popularity in 19th century Britain but because turtle meat was prohibitively expensive and difficult to import, an alternative ‘mock’ turtle soup was developed using calves’ head and feet. This is why the Mock Turtle in Alice in Wonderland has a body and shell of a turtle and the head, tail and feet of a calf. The final part of the course was the toast sandwiches. What is British afternoon tea without little sandwiches? They were very crunchy, with cucumber and other things I can’t remember – much more interesting than your average sandwiches, that’s for sure! 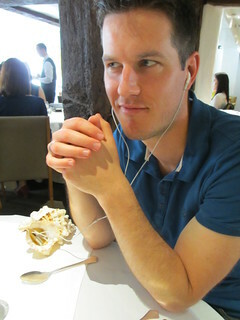 Course 8 – Sound of the Sea. This one was also memorable because of the audio track! They gave us each a conch shell with a little iPod inside and played beach sounds in our ears – waves crashing on the shore and washing back, sea gulls calling. Very soothing and relaxing! 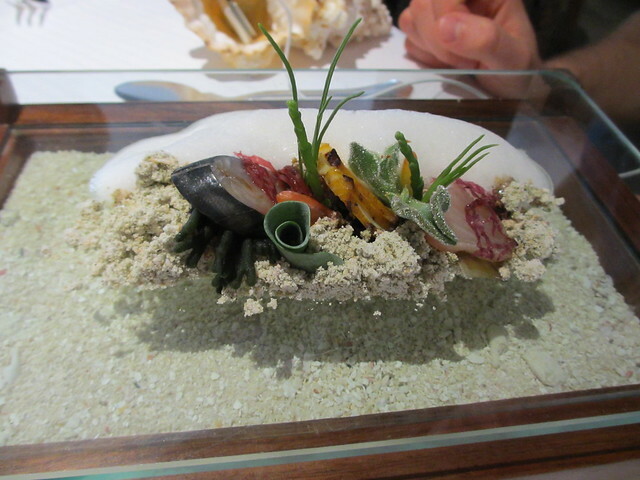 And then came the course – mostly Japanese seaweed, some beautiful sashimi and then sand and foam!! The foam was salty like sea salt, though I wasn’t too sure of the sand. It had the texture of sherbet, but without the popping, and was quite salty and fishy. 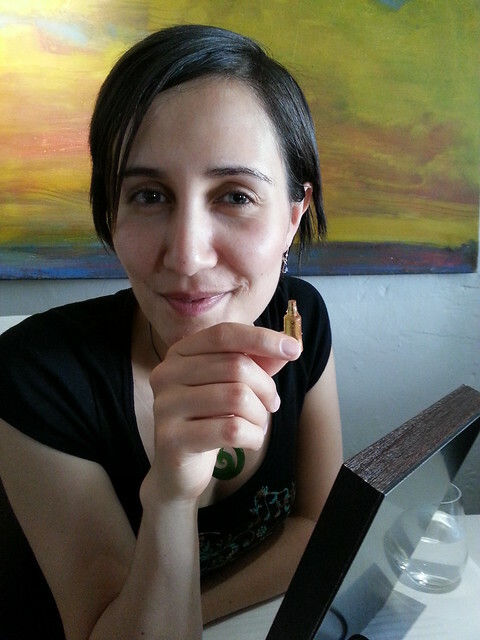 I loved all the different seaweeds, such a treat to try such different foodstuffs. We also ordered a small portions of some sake for the course which was a great complement – a good palate cleanser for all the salty and fishy flavours on the plate. Course 9 – Salmon Poached in a Liquorice Gel with Artichokes, Vanilla Mayonnaise and Golden Trout Roe. 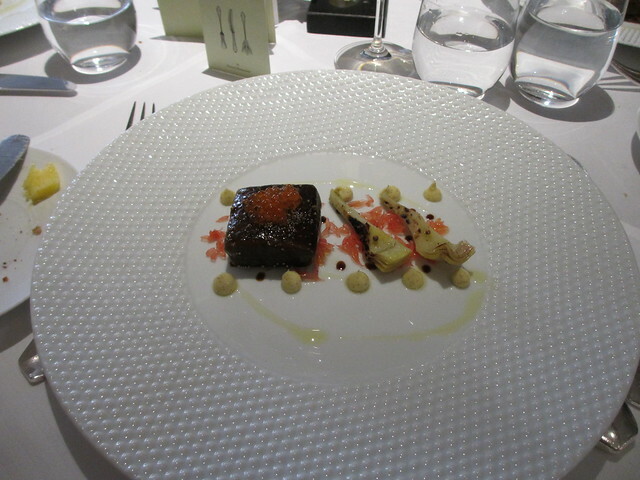 Delicate salmon which was perfectly cooked and a thin layer of gel coating it, it gave just the right bit of liquorice. 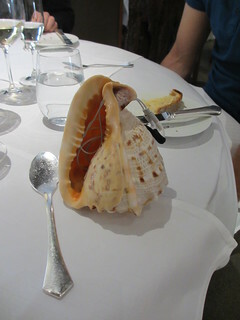 This dish wasn’t too rich or strong, which was good after the various full on flavours we’d had these last few courses. I really liked the bits of pink grapefruit which gave a nice tang on the plate. I made sure to wipe up every drop of vanilla mayonnaise. A great dish! They also brought some bread out at this point for eating with our courses. 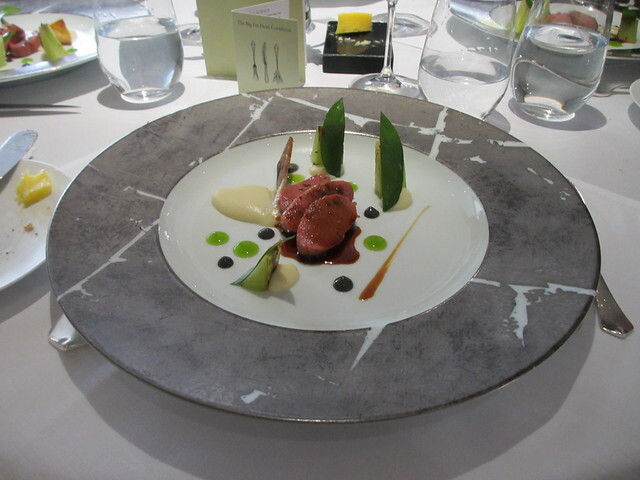 Course 10 – Lamb with Cucumber, Green Pepper and Caviar Oil. Being from New Zealand, we’re spoiled for great quality lamb. This lamb was beautiful as well but surprising came from an English farm! We expected the server to say it was kiwi! Grilled cucumber and onion and dill sauce was really great flavours. But this wasn’t the only dish of the course.. 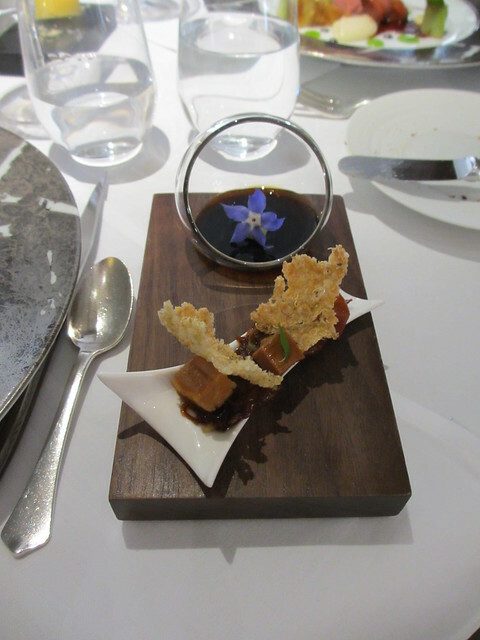 There was also a glass bowl of lamb and mint consomme and a mini platter of Lamb Tongue, Fried Sweetbread, Quinoa Crisps and Onions Caramelised in Balsamic. Yikes! The lamb tongue and everything in the foreground was a great combination of flavours and textures. 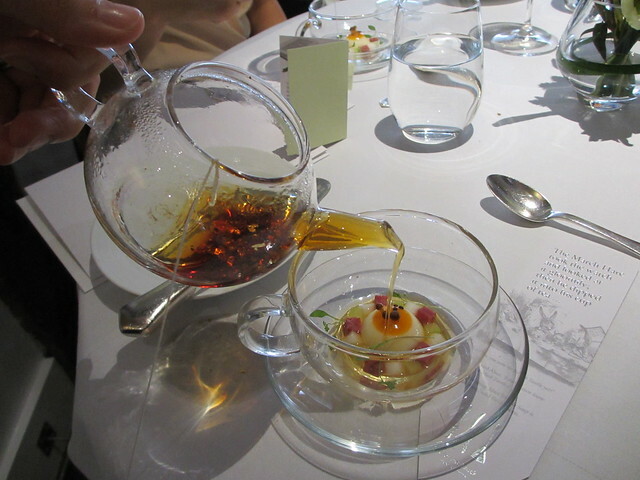 The consomme in the glass bowl was my least favourite thing of this whole dish, even if I mixed it with everything else. It was a bit cool and I was super keen on the lamb/mint combo they had. 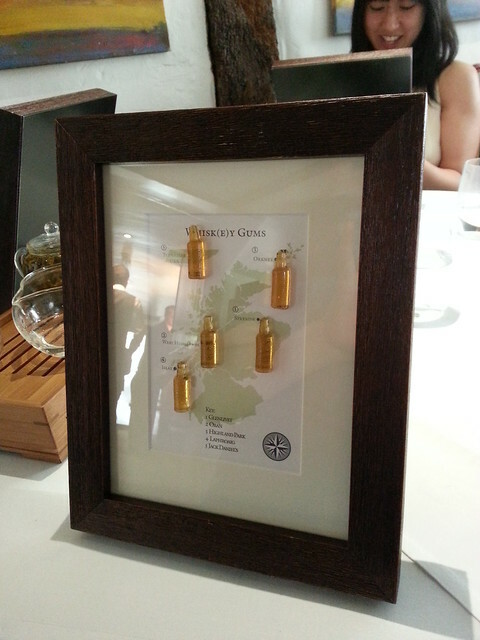 Course 11 – I didn’t even take a photo of this brief but interesting course. Hot and Iced Tea. A glass was put in front of us and we were told to not swirl the glass but to drink it without waiting. When we did drink it, the left half of the tea was warm and the right half was iced cold. Very crazy but cool! Of course it tasted nice as well, but it was the temperature that was exciting. Half hot, half cold! 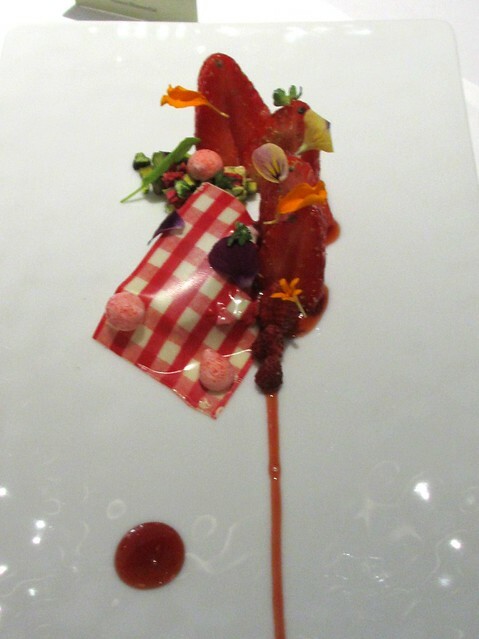 Course 12 – Macerated Strawberries with Olive Biscuit, Chamomile and Coriander, Jelly and Ice Cream Cornet. 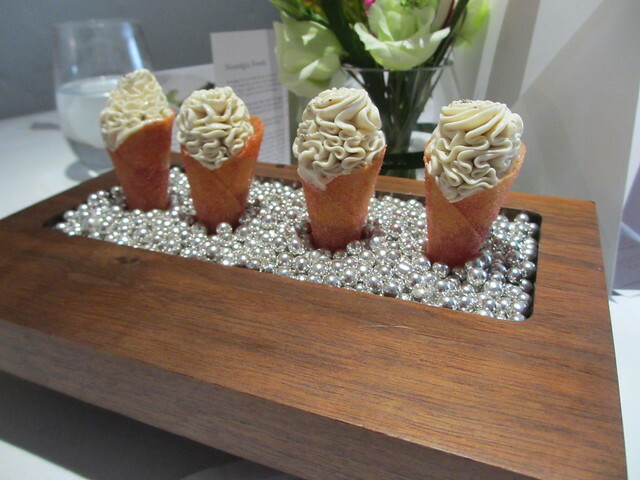 Again, a multi-part course, the first part were cute little ice creams with Earl Grey ice cream and strawberry jam. Delicious! And so cute! The second part of the course – is where my camera went on the fritz! So this is the only poor photo I got of this delicate and delectable plate. Three different kinds of strawberries, a white chocolate picnic blanket, a sweet strawberry sauce and some delicate flower petals which were quite tasty too. A work of art on a plate! 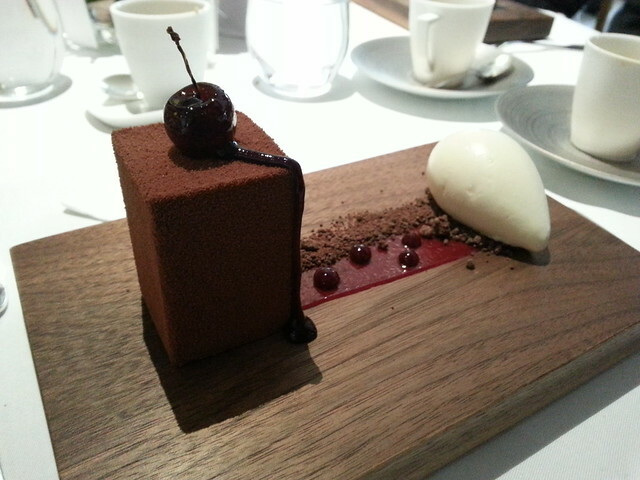 Course 13 – The “BFG” – Black Forest Gateau. This dish was delicious, but after 12 courses, I was getting full. Really full. 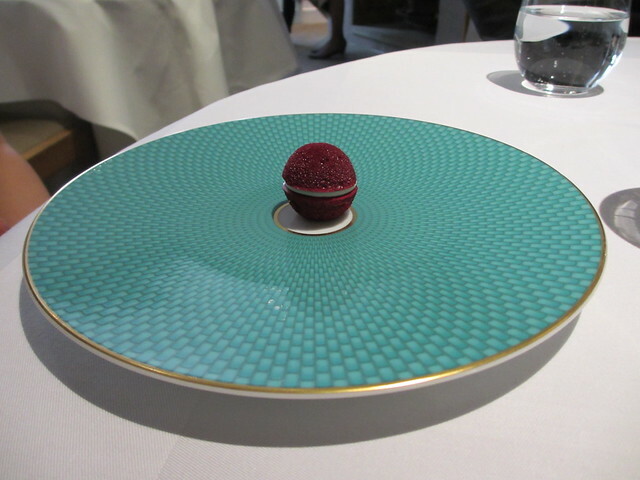 And this was the richest chocolate dessert I’d ever tried to eat. But it was amazing too. A dark chocolate gateau filled with gooey cherry sauce, chocolate crumbs and cherry sauce trickles across the plate to an amazing ice cream, though I don’t remember the flavour. What I do remember is I didn’t finish the dish! I know! Rob was so full and the dessert so rich, he couldn’t help me finish it either. It was amazing, but so so rich with dark chocolate and cherries. Still, if I hadn’t had had 12 courses previously, I would’ve demolished it. It was beautiful. 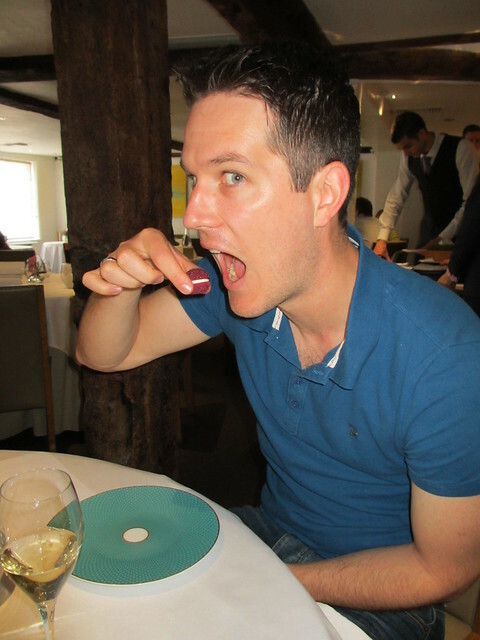 Course 14 – Whis(e)y Wine Gums. 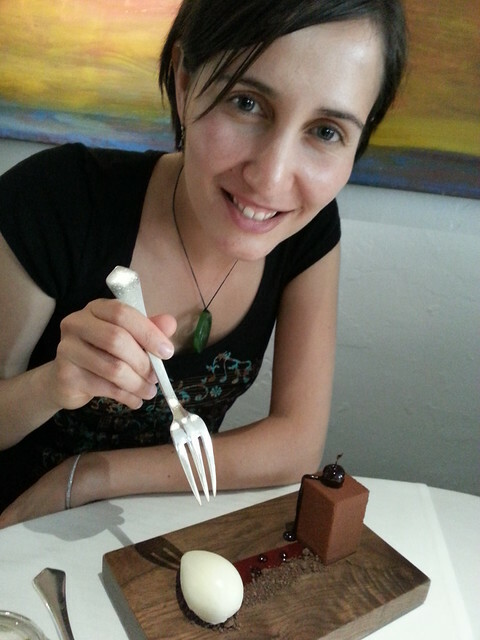 This refreshing and delicate course was a relief after the richness of the gateau. Heston had flavoured 4 wine gums like Scotch whiskey from different parts of Scotland and 1 wine gum like Jack Daniels from Tennessee. What an idea! This is where Rob’s scotch drinking came in handy, and he explained how some whiskey’s a light and others rich, and some are smokey or peaty. These wine gums really captured the key flavours of the different whiskeys, finishing with the comparatively sweet Jack Daniels wine gum. Fantastic and fresh and so surprising. They were all delicious and quite a sweet flavour adventure. 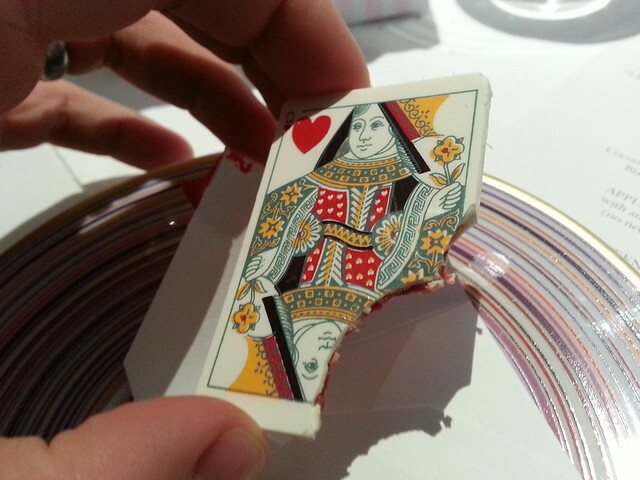 But we loved the Queen of Hearts the most. A white chocolate card with a strawberry jam filling of some description. Really lovely! Amazing. Amazing! 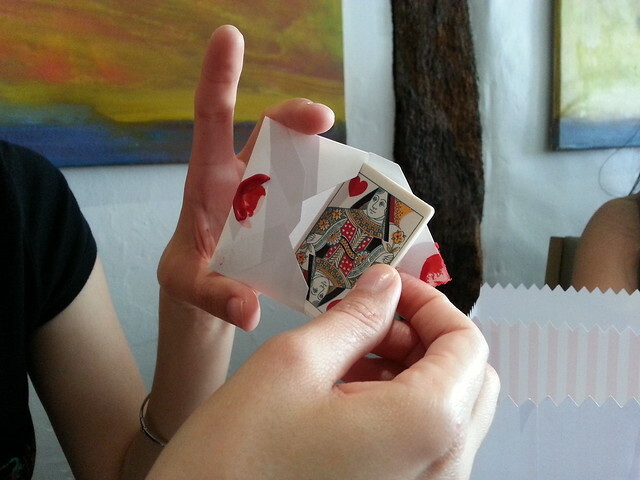 We were at The Fat Duck for 4 hours all together – a whole afternoon of entertainment. Fabulous foodie entertainment. We didn’t go with the wine tasting menu, but just ordered wine by the bottle and shared between the 4 of us. 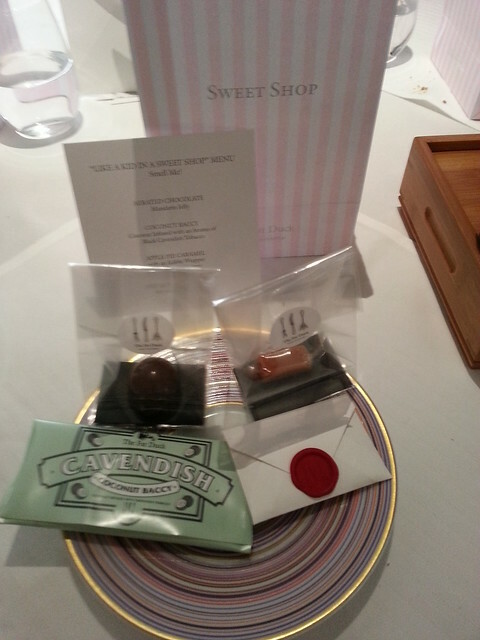 We also ordered some fancy teas and coffees during our dessert courses which were balanced and flavourful. The servers were really professional and helpful, but it sounded like most of them were French! All-round-amazing! 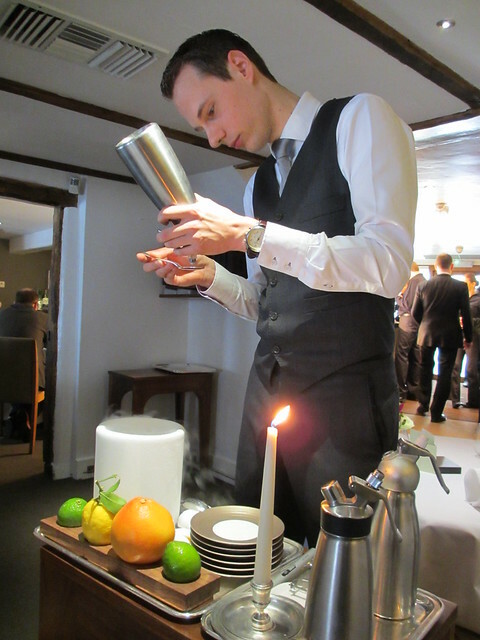 I would repeat the whole experience in a instant were it not for the price (£195 each for the set menu). Despite this though, I think I enjoyed the afternoon and the adventure of the 15 courses as much as a city weekend trip away. 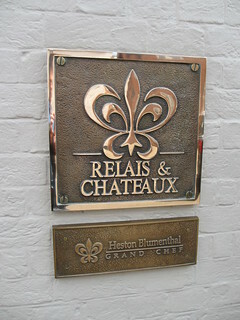 We were big fans of Heston before we moved over to the UK and for us, The Fat Duck is a once-in-a-lifetime experience. But, unless the menu changed significantly (ie half the courses were different) we probably wouldn’t go back any time soon. 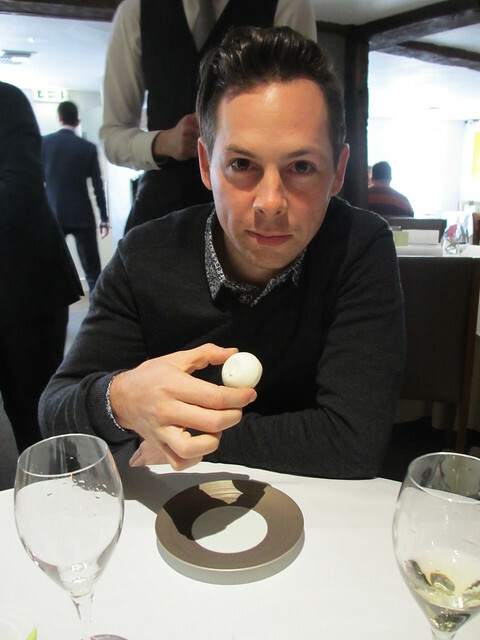 I would recommend anyone who wants a real food adventure to consider going to The Fat Duck, though you need to book in advance. Like, 3 months before when the reservations open for your desired day. 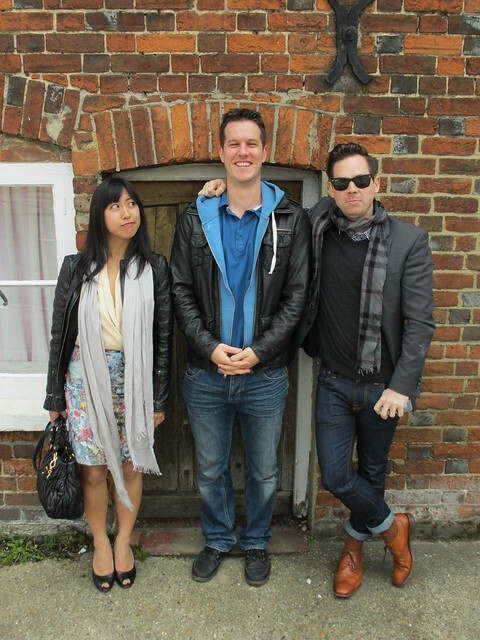 Big thanks to our friends D + A for encouraging us to go and helping make it a super fun day out!